Who doesn’t love Calvin & Hobbes? They are funny, brilliant and witty. The art, the ideas, the humour. Everything about these strips is perfect. Whew...3150 strips, plus all the extras Watterson drew for the Complete collection. I enjoyed many of them when they were first published (didn't always have a paper subscription), and despite having this collection since it was published in 2005 - had it shipped to Korea, and nearly lost it due to a fire - I'm only now finally reading it in its entirety. There are a great many strips that made me laugh (and even think), and I'll say his final year after his second sabbatical was more brilliant than perfunctory. Book one: So long, Pop! Book three: Hey Mom, can I get some plastic surgery? His train of thought is still boarding at the station. 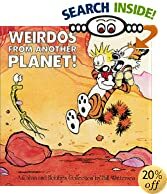 Book one: We go clear to Mars, and dumb ol' Hobbes forgets the camera! Book two: Gee, it was getting pretty good at the end. Book three: ... let's go exploring! "I’ve loved comic strips as long as I can remember. As a kid, I knew I wanted to be either a cartoonist or an astronaut. The latter was never much of a possibility, as I don’t even like riding in elevators. I kept my options open until seventh grade, but when I stopped understanding math and science, my choice was made. There is great personal satisfaction in attending to detail and quality, and I remain very proud of the standards the strip met day after day. I also liked the responsibility of knowing that, succeed or fail, it was all my own doing. This approach kept the strip very honest and personal--everything having to do with Calvin and Hobbes expressed my own ideas, my own values, my own way. I wrote every word, drew every line, and painted every color. It’s a rare gift to find such fulfilling work and I tried to show my appreciation by giving the strip everything I had to offer."